Working Hours: Monday to Friday: 9.00am - 6.00pm. Saturday appointments available. Sun Patrol Skin Cancer Centre Officer has been purpose-built to deliver the highest standard of care in Skin Cancer Medicine. We offer a skin cancer service like no other, with a specially qualified team of doctors who provide expert, trusted advice in the areas of skin cancer management. Our doctors are supported by a team of highly trained staff who will confidently address all your skin cancer concerns. 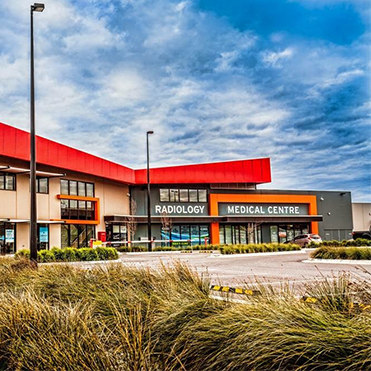 Conveniently located in the Arena Shopping Centre, Sun Patrol Skin Cancer Centre Officer provides vital skin cancer services that save lives. We give patients prompt and effective access to screening, diagnosis and treatment all under one roof. Thanks to our dedicated operating theatres and professional support team, patients face short waiting times to receive vital treatment. Envisioning a world where nobody dies from skin cancer, we strive every day to provide excellent service to our patients. We offer expert advice, full-body skin examinations, spot checks, treatment of all skin cancers and, most importantly, utmost peace of mind. Sun Patrol Skin Cancer Centre Officer is part of the National Skin Cancer Centres. We place a strong emphasis on excellence in medical care, which is strengthened by our commitment to research and education. All our doctors and support staff are involved in the ongoing education of GPs in Australia through university-certified Skin Cancer Medicine programs. Regular full-body skin examinations are vital for catching cancers before they become serious. Skin exams take about 15 - 30 minutes, and the doctor will start by asking about your skin cancer risk factors and general health. You will need to undress to your underwear. If you wish, we can provide a blanket or gown for you to wear while the doctor inspects your body from head to toe, looking for abnormal moles or spots. We will not examine the genital area unless you have any spots in that region which particularly concern you. The doctor will closely examine any unusual spots using a dermatoscope. This close-up perspective helps us assess whether a mole is normal or abnormal. It is a completely painless process that has been proven to increase the rate of skin cancer detection. We may also photograph a few spots to monitor changes over time, as this can be indicative of skin cancer. If the doctor finds a suspicious spot that might be skin cancer, a sample of skin will be removed and sent to a pathology lab to be thoroughly examined under a microscope. This is called a biopsy, and it helps confirm whether the suspicious spot is cancerous. The most common biopsy techniques are shave and punch biopsies, which are both done under a local anaesthetic. A shave biopsy involves shaving off the top layer of skin with a small surgical blade, while a punch biopsy uses a tool like a tiny cookie cutter to remove all the layers of skin. The treatment you receive for skin cancer will depend on the type, size and location of the skin cancer, and whether it has spread to other parts of your body. We offer various surgical and non-surgical treatments, including excisions of the tumour and surrounding tissue to ensure all the cancerous cells are entirely removed, curettage which is the method of scraping and burning the skin cancer, cryotherapy which is the method of freezing off the skin cancer with liquid nitrogen, and topical applications of creams that stimulate the immune system and destroy skin cancer. Improve access to skin cancer care and reduce the mortality and morbidity of the disease. Reduce the waiting time for patients to receive efficient diagnosis and treatment. Provide vital skin cancer care to communities with limited or no access to specialists. Offer a high-quality referral option to local GPs managing patients outside their scope. Relieve the public hospital system as most patients cannot afford specialist care. Save lives by dramatically reducing the delay in diagnosis and treatment. your skin health needs promptly and efficiently, and our specially trained support staff will minimise waiting times and ensure your experience is as pleasant as possible. several payment options, including cash, EFTPOS and credit card. For your convenience, we use Medicare online so your rebate will be refunded promptly. Please ask our staff for more information. With the exception of Veterans who will continue to be fully bulk billed, patients will fall into one of two categories: concession and private. The patient is required to pay $150 on the day of the appointment and will receive a $72.80 Medicare rebate. The patient is required to pay $130 on the day of the appointment and will receive a $72.80 Medicare rebate.